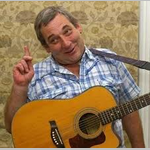 We have managed to shanghai Geoff from “Three Sheets to the Wind” to do a solo booking. He is known to us as The Voice and down through the years he has regaled us with shanties, ballads and humorous ditties. He has an easy going style and collects anagrams which he will share with you. Come and bring your lungs for the choruses.